This quote captures the essence of the Salon experience. The combination of genres, times, and styles is in its most simple form a special experience for the human spirit. It is also a means to communicate with other cultures and participate in their delights. The mix of classical, jazz, modern, and digital is an affirmation of the timelessness of music. In community, music represents a tool for union and understanding, something we all can have in common regardless of our differences. The program is rich and eclectic and it will invite you into a surprising world of creative musical ideas. If you have not purchased the ticket yet, you will be receiving one last email shortly with the purchasing instructions. It is very easy, just click the purchase button and you will be guided to the proper forms. 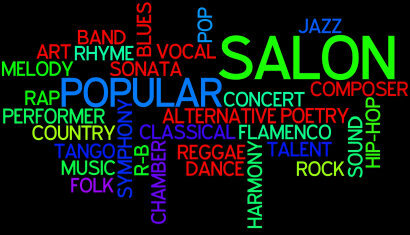 The Salon is an event without a profit motivation as all the proceeds are directed to the performers. Come listen and enjoy music in its purest form. P4Q Quartet will perform A Thousand Years composed by Christina Perry, the first movement to Grieg’s String Quartet No. 1 in g minor, Opus 27, and the last movement of Haydn’s The Joke. Charles Lewis Trio will perform original and traditional jazz and blues compositions and share a lifetime of wisdom on the interplay of vocalist, instrumentalist, and song in jazz. Jorge Montes will perform Michio Miyagi’s “Haru no Umi” (spring ocean), one movement of History De Tango, Libertango composed by Astor Piazzolla , and Tristeza composed by Christopher Caliendo All for flute and guitar. Mr. Montes performance will include a computer-based real time music visualization application. Phoenix Brass Trio will perform Trio for Brass composed by Anthony Plog. Yumi LaRosa will perform Sevillanas (folk dance from southern Spain) and Alegrias, one of the traditional flamenco forms. This entry was posted in Performances and tagged salon, andrea clearfield, community, Scottsdale, Global Experience, classical music by John Zerio. Bookmark the permalink.